Here is a YouTube video of a Hubel & Wiesel experiment from 1965 in the visual cortex. The video shows the experimenters outlining the receptive field of a simple cell in the first part of the video using symbols. Crosses are used for excitatory responses, and triangles for inhibitory responses. As shown in the video, neuron firing rate increased when the edge of a bar of light touched the crosses present on the top left. It is not just the orientation and location of light bar, but it seems that the light bar's edge is defining the firing rate, and thus determines the receptive field. So, the oriented receptive field of the cell seems to be defined w.r.t to the stimulus edges, rather than the bright and dark regions stimulating the on-center and off-surround parts of the receptive field. It seems that the simple cell was getting triggered when the edge of the light bar touched the three lines made by cross marks and triangles in that particular orientation. So, the cell under consideration was responding to edges at three separate locations. Is my understanding correct ? 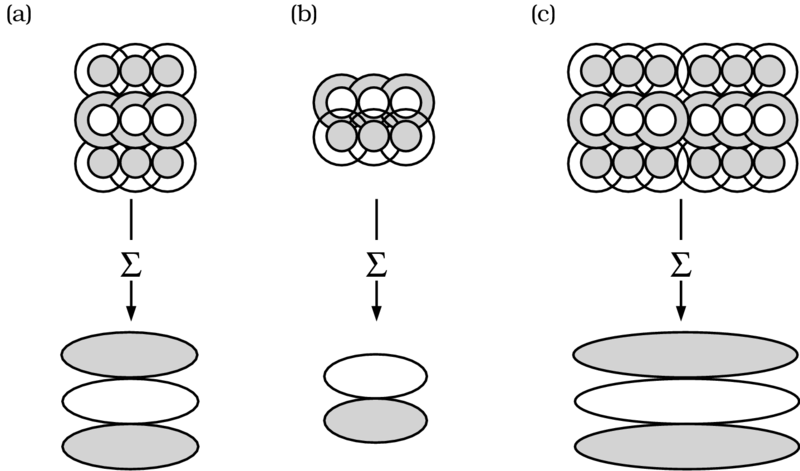 Please help me in understanding how oriented receptive fields made up with center-surround concept explain the excitation at the edge observed. Perhaps it can be seen as the derivative of a box-like receptive field, or an oriented receptive field. 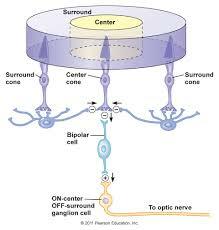 The retinal ganglion cells (RGCs) and the neurons in the upstream lateral geniculate nucleus (LGN) both have relatively simple receptive fields that are organized in in a center-surround fashion (Fig. 1). The ON-centers are sandwiched between linear arrays of OFF-surrounds. The cell will not respond when the OFF surrounds are illuminated (1:20 point in clip), regardless whether the ON-centers are illuminated or not; the stimulation of the entire ON-center and OFF-center area results in zero activity (2:30 in clip). A stimulus oriented obliquely to the RF also results in zero-activity, because the ON and OFF parts are both stimulated (1:50). Not the answer you're looking for? Browse other questions tagged neuroscience vision neurophysiology sensation or ask your own question. What is the definition of a receptive field?